Bicyclists wanting to help make riding state trails enjoyable can now join a trail-monitoring program that’s as easy as riding a bike. 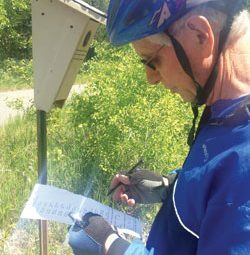 Monitoring is quite simple: bicyclists who enjoy regularly riding a state bike trail can also report maintenance and safety issues to the Department of Natural Resources (DNR) in a kind of “Adopt a Trail” program. Bicyclists ride about a six-mile section of the trail once a week or so during the biking season. Trail monitors watch for fallen trees across the trail, developing potholes and washouts and debris after a heavy rain. For minor issues they clear off the trail when possible, just as any courteous or thoughtful cyclist would do. Or they may report to the DNR so DNR staff can do the clearing. Monitors do not do any policing, but they can report trail rule violations they’ve observed to law enforcement. Most of the time, the volunteer ride is just another relaxing time on the trail with no issues. Monitors are covered by workers’ compensation and liability insurance for any rare occurrences, as is the case with all official volunteers of the DNR, which also does a criminal background check (not driving, character or financial, just criminal court actions) of monitors. Cyclists can join a group that is already monitoring, or, if there is no group, start one or monitor solo.